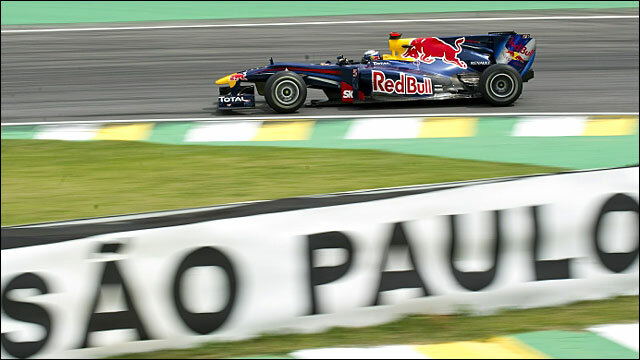 Red Bull have established themselves as the team to beat at the Brazilian Grand Prix by dominating practice on Friday. Sebastian Vettel and Mark Webber were first and second fastest in both sessions, well clear of their rivals. Ferrari's championship leader Fernando Alonso was third fastest in the afternoon, a position McLaren's Lewis Hamilton occupied in the morning. McLaren's Jenson Button, the fifth title contender, was seventh in the afternoon's practice. The Englishman had been fourth fastest in the morning session. Throughout the day, the Red Bulls looked comfortably the quickest cars as the teams spent the day evaluating set-up and various new parts on their cars. They tried to cram more work into Friday's running than normal as they expect it to be raining on Saturday and dry for the race. So Friday was their only chance to prepare the cars for the race. Vettel - who is fourth in the championship, 25 points behind Alonso - was 0.482 seconds quicker than Webber in the first session, although the Australian narrowed that margin to just 0.104secs in the afternoon. Webber, second in the championship 11 points behind Alonso, was just 0.035secs ahead of McLaren's Lewis Hamilton in the morning session, and 0.256secs clear of Alonso in the afternoon. Webber said: "It was a good Friday, we got through everything we wanted to." Vettel added: "It was a good start. The car feels all right. Not 100% happy yet - I think we can still improve it." Hamilton is third, 21 points behind Alonso, while Button still has a mathematical chance with a 42-point deficit and 50 points still available. 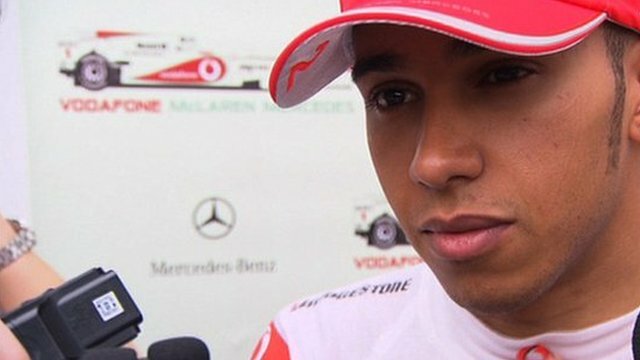 Hamilton said McLaren had had a "good" day, but sounded downbeat about his car's performance. "The car felt good," he said. "Not enough downforce and to pick up speed through the corners you need more grip and I just don't have it. "We have a slight update to the floor which has helped but unfortunately not a big enough step. "We are clearly not as quick as the Red Bulls as they are over half a second ahead of us so it'll be interesting tomorrow when it's wet. "I feel confident that if it is wet we should be able to fight for the front row. "I'm getting everything I can out of the car out there but those guys have such a big gap." Ferrari suffered two reliability problems. Alonso stopped on the track with an engine failure close to the end of the first session and Massa had a clutch failure in the second. Ferrari said the engine in Alonso's car was at the end of its life and the failure happened two laps earlier than expected. The team had anyway been planning to change Alonso's engine between first and second practice, and the Spaniard said the failure did not unduly concern him. "This morning (it) was already programmed to change the engine between the two sessions," Alonso said. "We used a very, very old engine this morning. There was only three laps to go. "Everything is going according to plan, fingers crossed, and we still have plenty of engines left to use. "Red Bull are still very competitive so it seems another strong weekend for them. "Right behind them we can fight with McLaren to be the first ones to be behind Red Bull and put Red Bull in problems. "Obviously it's important for us to be as close to Red Bull as possible to fight for pole position and hopefully we can do that tomorrow as well. "The forecast is for rain tomorrow so we'll see how this will affect the positions - sometimes it can be good or bad for you. "There is very little to lose for us at the moment. "The other four contenders if they do a bad qualifying, it is more of a problem as they have to catch extra points, but for us it is less of a risk." In the morning session, there were two crashes at Turn Seven, when Renault's Vitaly Petrov and Sauber's Kamui Kobayashi both lost control at the quick uphill right-hander known as Ferra Dura.